My neighbors must think I am a bit weird! Anytime I mow our lawn I wear an old pair of Mary Jane shoes. I wore them for work a few years back and they were so comfy I couldn't toss them out. They are a bit beat up so I just put them to the side knowing I would need them eventually. Well now that I am trying to be more frugal and instead of paying to have the lawn done I just do it myself. I must be quiet the sight out there since I wear black socks with my Mary Janes lol. I don't want to ruin white ones with stains! It took some convincing to tell my husband it was ok to let me mow the lawns. He finally was like ok fine when I pointed out 3 other women in our neighborhood that mow their lawn too! I oddly find it enjoyable. Its the perfect time to get brainstorming done. I must admit I do need new shoes to do it in though since they are getting pretty beat up. 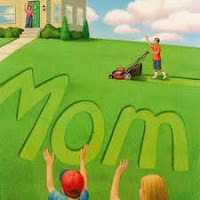 I thought it was funny today when I did the lawn I made the letter "L" in the yard! Next time I will take a picture to show everyone. I use an electric lawn mower and I have deemed lawn mowing "outdoor vacuuming"! Who does the yard work in your house? And do you have any tips for me? I have GOT to see a picture of these Mary Janes! 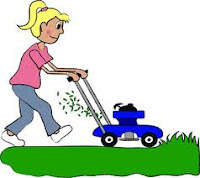 :) LOL - I have tried to mow our lawn, and I just do not have the strength to push the lawnmower - even the self-proppeled is too powerful for me to manage it. And we have lots of hills so I consider it a bit dangerous since I can't control the heavy machine. But mowing has always looked kind of relaxing to me!